The Islamic Republic of Afghanistan is a landlocked country at the heart of Asia, bordered by Iran to the west, Turkmenistan, Uzbekistan, and Tajikistan to the north, China in the far northeast and Pakistan, to South and East. Afghanistan is the possibility of interlink between Central Asian nations with South Asian Nations. The total length of Afghanistan border is 5529 km long. The longest Afghanistan border is with Pakistan stretching to 2430 km. Afghanistan has been the battle ground for more than two decades, as a result country economy and infrastructure has been badly damaged. The political and security transition continues to take a heavy toll on Afghanistan’s economy. Economic growth is estimated to have fallen further 1.3% in 2014 from and an average of 8.7 percent during 2005-14. Table-1 mentions few of the basic facts of Afghanistan. Geographic coordinates latitudes 34° 31′ N, and longitudes 69° 11′ E.
The economy of Afghanistan last two years has shown very poor growth. The average growth rate maintain at 8.7% due to the infusion of billions of dollars in international assistance and investments as well as remittances from Afghan expatriates. The help that came from expatriates and outside investments saw this significant increase when there was more political reliability after the fall of the many terrorist groups in the early 2000s. The country has fair deposits of mineral wealth which remain unexploited. Afghanistan exports fruits, nuts, lambskins, gemstones and handwoven carpets. However the country current economy is unstable and dubious. Afghanistan was an agrarian economy in the early 2000, Agriculture and herding were the main occupations of the people of Afghanistan. Now the situation has considerably change and service sector is continuously showing a remarkable growth from last one decade and now contributing more than 50% of GDP as shown in Figure-1. Transport & storage and government services are the main contributor in service sector. 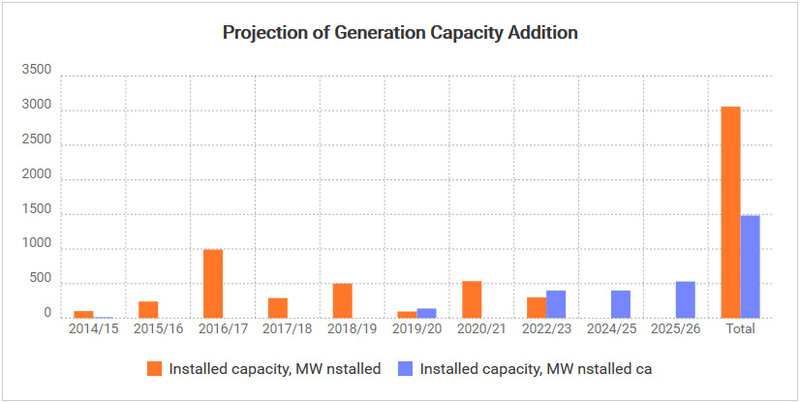 Total power plant installed capacity of Afghanistan is 519 MW; out of total installed capacity 49% is hydro based generation rest is thermal and Diesel generator as shown in Figure-28. The percentage of the population with access to electricity in Afghanistan is among the lowest in the world. The Ministry of Energy and Water estimates that about 43 percent of Afghans have access to electricity. Afghanistan power generation is primarily hydro based and this slightly increased in the past. Local generation has remained constant in the range of 800 to 1000 GWh due to decrease in thermal based generation and increase in hydro based generation. Most of the existing thermal power plants of Afghanistan are fired by imported diesel fuel. The List of Existing hydro and thermal plant has shown below in Table-3 & Table-49. Due to higher dependency on Hydro plant, the domestic generation shows the greater seasonal variation. The power sector situation has improved significantly in the major urban population centers along the critical North East corridor between Mazar-e-Sharif and Kabul, following the import of power from Uzbekistan and the rehabilitation of three hydro plants (Mahipar and Sarobi completed, and Naghlu ongoing). Increasing parts of some urban centers, for example Kabul, Herat, Mazar-e-Sharif, and Pul-e-Khumri, now have 24-hour power supply for the first time in decade. Currently, Afghanistan’s power system is quite complex. It operates in nine different ‘islands’ – power grids – depending on power supply sources. This means that different regions are supplied by different sources. The voltage levels 220 kV, 110 kV and 132 kV are used in the transmission system of Afghanistan. DABS is continuously working on increasing the access to electricity in Afghanistan. 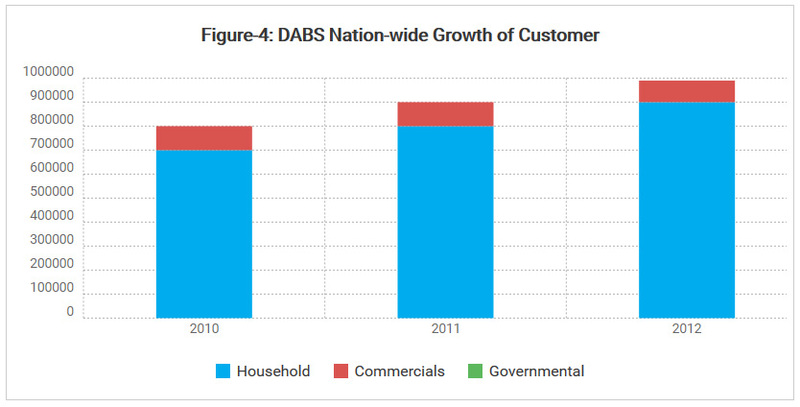 DABS nationwide growth of customer shown in Figure-4. The (MEW) Ministry of Energy and Water is the policy making body in the electricity sector in the country. At present, the policy and regulatory framework governing the electricity sector in Afghanistan is still evolving. While the Electricity Law has been enacted, several policies/regulations such as energy policy, energy efficiency policy, Afghanistan Electricity Regulatory Authority, etc. are still under the draft stage. 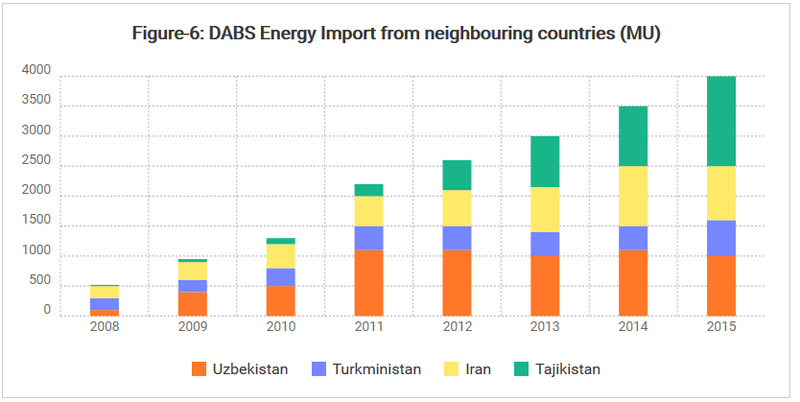 The generation, transmission and distribution of electricity is carried out by vertically integrated utility namely DABS (Da Afghanistan Breshna Shekat). CBET is the main source for fulfil Afghanistan power demand, 81% of total power consumption of the country met through power import during 2015 as depicted in Figure-5. Uzbekistan (33%) under 1 contract. The Key Features of existing PPA for CBET are summarized below in Table-5. All contracts except the PPA with Tajikistan have a short duration and thus provide little supply security. The contracts except with hydro-dominated Tajikistan provide year-round firm energy. Tariffs range from 2.0 to 6.0 cents/kWh. Imports from Uzbekistan, which has the highest share in imports, are the most expensive. The tariffs for planned imports from Turkmenistan and Uzbekistan will be higher than the existing ones. Power import from Uzbekistan increased significantly after completion of 220 KV ADB transmission line in 2009. TUTAP is the acronym for Turkmenistan, Uzbekistan, Tajikistan, Afghanistan and Pakistan. TUTAP’s largest contributor in terms of supply will be Turkmenistan, the country having the fourth largest gas reserves in the world. The regional project for which negotiations are ongoing is supposed to connect the aforementioned countries through a high voltage transmission system. The project intends to meet the energy demands of Afghanistan in a first phase and then transmit sufficient energy to Pakistan, which currently suffers from a severe energy deficit. The peak electricity shortage in Pakistan is during summertime, while Afghanistan requires more power during wintertime. TUTAP’s other advantage would be to ‘unify’ Afghanistan power grid, resulting in an integrated transmission network. (Currently Afghanistan’s power system operates in nine islands fed from different supply sources.) The CASA-1000 project comprises the bulk power transfer of the summer surplus from Kirgizstan and Tajikistan to Pakistan via Kabul via a high voltage direct current system, with an additional converter station for 300 MW bidirectional transfer at Kabul. The boundary condition after implementing the TUTAP and CASA has shown in Figure-7. The Major Power Projects which are most likely to come in Afghanistan has been depicted in Table-6. 2020 CASA-1000 with 300 MW with bidirectional converter at Kabul; Possible import of 300 MW during summer. 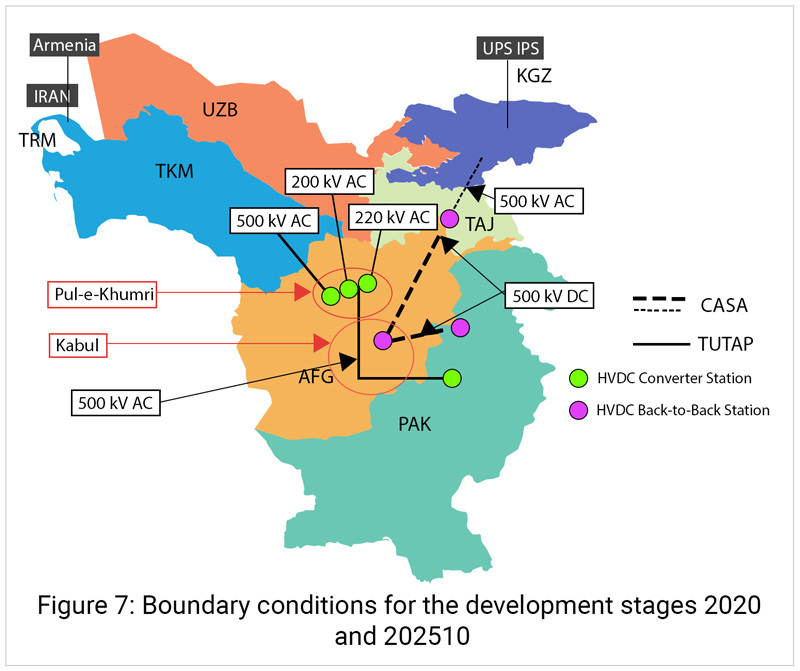 2020 Development of TUTAP system by building a 500 KV line from Kabul South via Jalalabad to the border to Pakistan with a back-to-back converter station to feed power from Afghanistan to the network of Pakistan. 2020 Sheberghan gas fired power plant with up to 400 MW installed capacity. 2025 Additional 500 MW for a total of 1000 MW from the TKM interconnection in Phase-3. However, these import projects are expected to confer strong future economic dividends by increasing availability and access of electricity. The basic requirement for economy boost and power sector development in Afghanistan is a stable political environment. The long term PPA will create an energy security for the country. TUTAP and CASA-1000 seem to be promising projects, although the road to their materialisation in their planned full extent will be long. They are dependent on different factors and different players, not least on continued long-term funding. Nestled in the Eastern Himalayas and flanked by giant neighbors– China to the north and north-west and India to the south, south-west and east– Bhutan is a small country in terms of population as well as geographical size. The Kingdom of Bhutan is a small landlocked country located to the eastern side of the Himalayas in South Asia. Bhutan shares territorial boundary of 605 kilometers with the Indian state of Sikkim in the west, West Bengal in the southwest, Assam in the south and southeast, and Arunachal Pradesh in the east. Most of the population lives in the central highlands, and almost two-thirds are classified as rural inhabitants. The Bhutanese community is predominantly agrarian and living in the rural areas. However, more and more people have been moving into urban areas these days. Table-1 mentions few of the basic facts of Bhutan. Geographic coordinates latitudes 27° 30′ N, and longitudes 90° 30′ E.
Bhutan is primarily an agrarian economy. It is one of the fastest growing countries of the world with an average GDP growth rate of 7.6%. The prominent sectors i.e. agriculture and related sector, construction, electricity and water, community and personal services etc. are having a higher contribution in overall GDP. However, in this agrarian economy other sectors are also showing equal and greater presence in the last few years as depicted in figure-1. 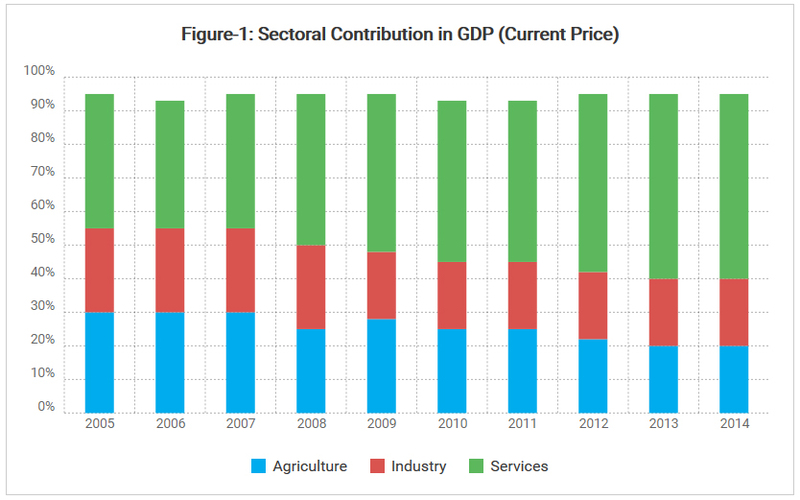 During the last ten years, the agriculture sectors contribution in the overall nominal GDP is reducing and reached at 16.2% in 2013 from 24% in 2003. Revenue from power exports are one of the major contributors in Bhutan’s GDP that varied in the range of 11 to 21% of GDP during the 2003-2013. It is expected that Bhutan’s GDP will be driven by expansion in the industry sector mainly through the ongoing hydropower construction and expected starting of new hydropower projects in future. 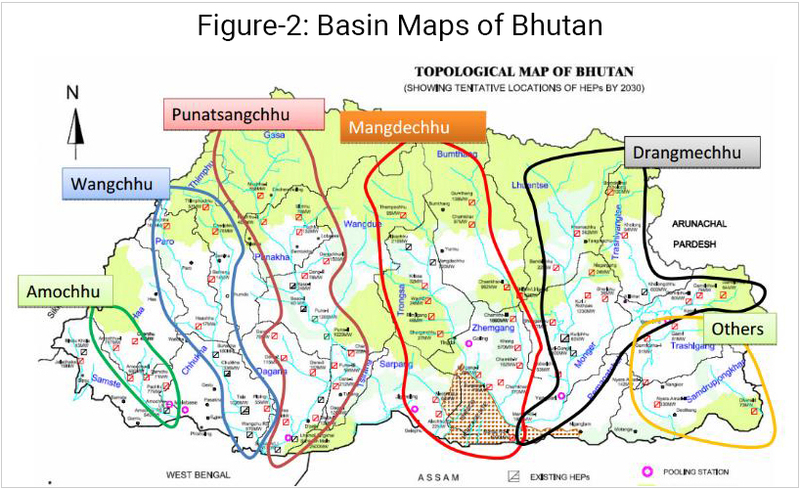 The Kingdom of Bhutan is endowed with large potential to produce hydropower of 23 GW, with only a small fraction around 5% of capacity so far tapped. Details of Hydro potential basin wise is given in table-3 and basin map has been shown in figure-2. Bhutan total installed capacity is around 1488 MW; major power plant are export oriented. The major existing plant are exporting the power to India after meeting their internal demand as per government agreements. Existing installed capacity details is given in table-4. Bhutan is exporting 4,000-5,000 MU electricity annually to India and its internal demand is increasing due to population growth and increase in electricity per capita consumption. In last 5 year, it’s varies from 1000-2000 MU annually. Bhutan is only country in South Asian countries which is having high surplus of electricity and exporting to India continuously. This trend is expected to goes on continuously and also going increase power export, as per NTGMP plan. 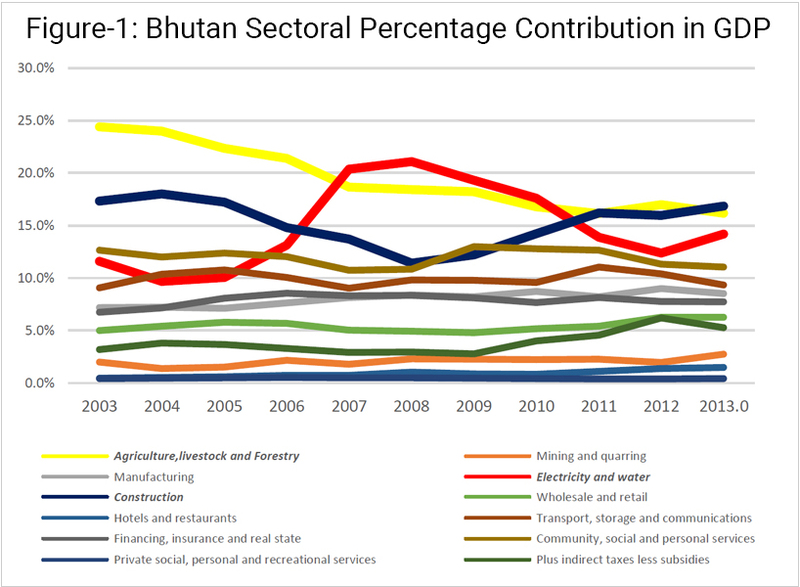 Bhutan year wise load demand profile is depicted in figure-3. Bhutan power generation is majorly dependent on the Run of River (RoR) type hydropower plants. 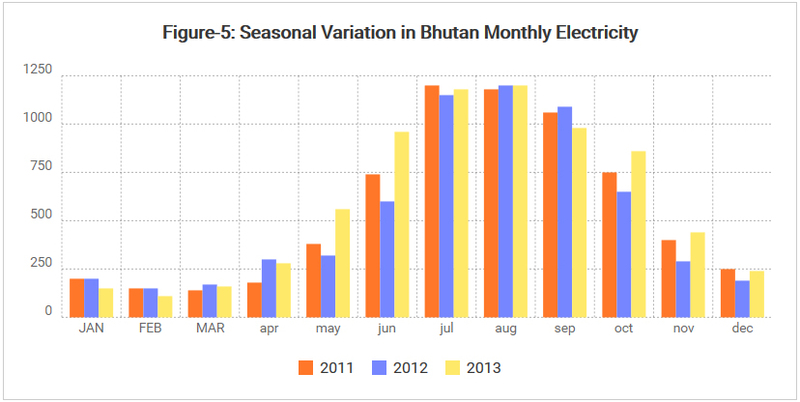 The monthly variation in Bhutan’s rainfall is directly having an impact on its power generation due to change in water flows as shown in figure-5. Bhutan is importing power from India during the dry season (November to March: due to low rainfall resulting in less hydro power generation); however the quantity is very less comparative to power export. Bhutan power imports from Binaguri, Birapara, Salakoti and Rangia substations India. Planning body: Department of Hydropower & Power Systems under the Ministry of Economic Affairs is responsible for policy making and planning for all aspects of energy and power sector in Bhutan. Regulatory body: Bhutan electricity authority (BEA) is an autonomous regulatory body and licensing authority for generation, transmission and distribution of electricity. Generation: Druk Green Power Corporation (DGPC) and BPC (Bhutan Power Corporation) is responsible for managing all power plants which is fully owned by the Royal Government of Bhutan. BPC is responsible for domestic power supply, and Druk Green Power Company (DGPC), responsible for operating the export-oriented hydropower projects. Transmission & Distribution: BPC owns and operates the transmission & distribution power sector in the country under licenses from BEA. The current Bhutan-India experience in CBET demonstrates the efficacy and effectiveness of the governmental agreement and arrangements. Intergovernmental hydropower projects in Bhutan are being undertaken under a unique arrangement between India and Bhutan, reflecting close links between the two countries. Under the “10,000 MW by 2020” bilateral cooperation agreement signed on 26th July 2006 and the protocol to the agreement signed on 16th March 2009, the RGoB and GoI agreed to develop 5 intergovernmental projects (Chhuka, Kurichhu, Tala have been commissioned, and Punatsangchhu I, Punatsangchhu II, Mangdechhu are under construction). As per the Royal government of Bhutan National Transmission Grid Master Plan (NTGMP), it was expected that by 2020, power generation capacity of 10,334 MW will be installed primarily for export purpose. Transmission lines as per NTGMP plan has shown below in figure-7 by 2020 and figure-8 by 2030. However, various projects have already been delayed by 3 to 6 years at different stages of implementation. As per the government planning, Bhutan will be self-sufficient in meeting its domestic electricity demand during dry season after 2017 and its power export will be doubled and expects a high surge in the economy due to power trade. 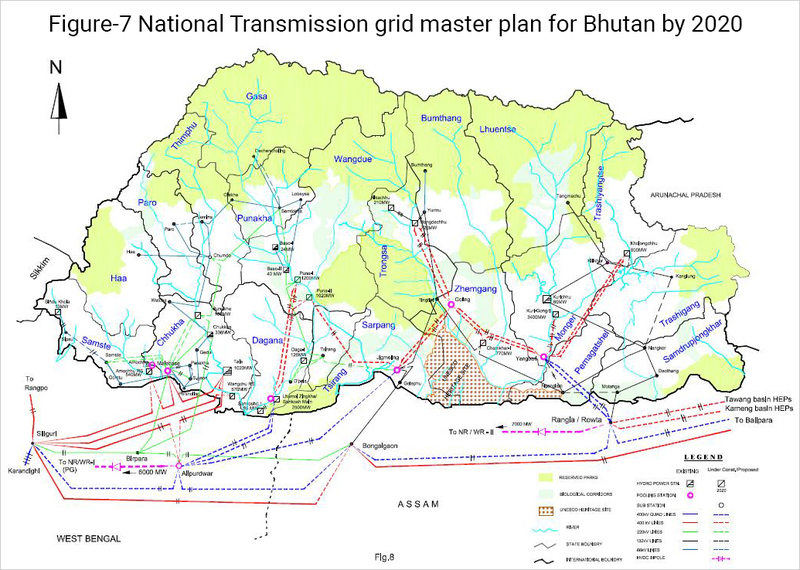 Bhutan has already developed their transmission grid master plan considering the future generation plants and power export. All these projects, now expected to be complete from 2014-2025. Table-6 depicts the upcoming plants, their capacity and location. Hydro power projects gestation period is high compare to the other power projects, hence the expected investment required will be needed over the 5-10 years till the project commissioning date. For development of these 10,000 MW capacity hydro projects will required around USD 11.9 Billion for plant construction and to develop associated transmission infrastructure for evacuation of power. It is expected that Bhutan’s GDP will be driven by expansion in the industry sector mainly through the ongoing hydropower construction and expected. 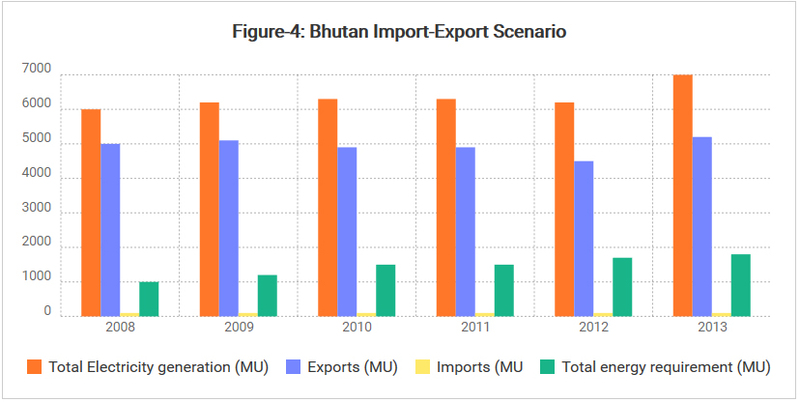 Imports of Bhutan is increasing sharply and so also is balance of trade (in negative) is increasing sharply. Bhutan is importing large amount of equipment’s and material needed to build hydropower plants. The situation is expected to be continue for next few years. Due to the construction of new hydro plants, debts of Bhutan is increasing continuously for prolonged periods of time. However, these projects are expected to confer strong future economic dividends, boosting future GDP growth and exports. The risk is minimal for the projects due to strong track record of project implementation, commercial viability, and close economic and political ties with India, Bhutan’s main provider of financing for hydropower projects and the key consumer of its electricity exports is India. India, a South Asian nation, is the is the seventh-largest country by area, the second-most populous country with over 1.2 billion people, and the most populous democracy in the world. India boasts of an immensely rich cultural heritage including numerous languages, traditions and people. India is the world’s largest democracy implemented its Constitution in 1950 that provided for a parliamentary system of Government with a bicameral parliament and three independent branches: the executive, the legislature and the judiciary. The country has a federal structure with elected governments in States. Majority of population lives in the rural areas and level of urbanization has remained around 27.82%.Table-1 mentions some basic facts of India. Land Area 3,287,240 Sq. km. Coastline 7,517 km, including the mainland, the coastlines of Andaman and Nicobar Islands in the Bay of Bengal and Lakshwadweep Islands in the Arabian Sea. Official language Hindi, English and at least 16 other official languages. The Economy of India is the seventh-largest in the world by nominal GDP and the third-largest by purchasing power parity (PPP). The country classified as Newly Industrialized Country, one of the G-20 major economies, a member of BRICS and a developing economy with approximately 7% average growth rate for the last two decades. India is set to emerge as the world’s fastest-growing major economy by 2015 ahead of China, as per the recent report by The World Bank. India’s Gross Domestic Product (GDP) is expected to grow at 7.5 per cent in 2015, as per the report. The improvement in India’s economic fundamentals has accelerated in the year 2015 with the combined impact of strong government reforms, RBI’s inflation focus supported by benign global commodity prices. India economy depends on service sector. Services sector 57.03% to the Indian economy. Agriculture, industry, mining and manufacturing contributes 15.79 %, 24.77%, 2.13% and 12.89% respectively to the Indian economy. Though agriculture sector contributes only 15.79 % of India’s economy it employees 48.9% population. Industry and service sector employees 24.3% and 26.9% respectively. Power Sector in India has grown significantly since independence both in the installed electricity generating capacity and transmission & distribution (T&D) system. The total power generating capacity of (utilities & non utilities) has increased from meagre 1362 MW in 1947 to 271 GW at the end of March, 2015. 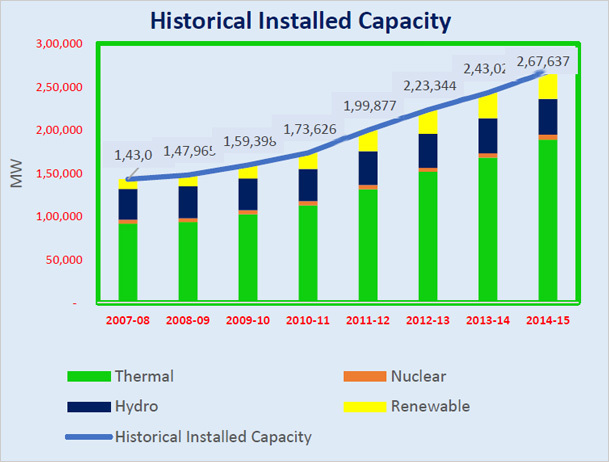 The per capita electricity consumption which was mere 16.3 kWh in1947 has increased to 1010 KW h in 2014-15. 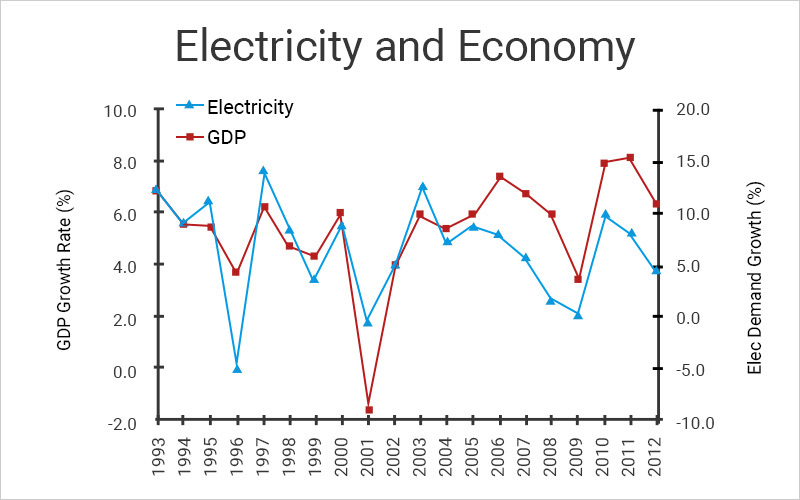 Despite this, the growth of electricity demand has surpassed the power supply and our country has been facing power shortages during peak electricity demand in spite of the main fold growth over the years. Government of India lays special emphasis on reduction of T&D losses and demand side management to optimally utilize the limited resources. Concerted efforts are going on to bridge the gap of demand and supply through policy initiatives, such as Development of Power Projects on Tariff based bidding, New Hydro Policy, Private Sector Participation in Transmission sector, National Mission on Enhanced Energy Efficiency, Focus on development of Renewable Energy Sources (RES) and development of the Ultra Mega Power Projects (UMPP). 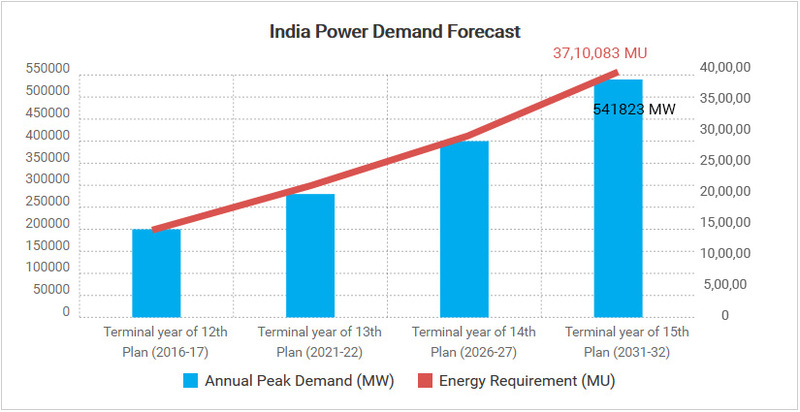 As per the17th Power survey, it is estimate that, the peak demand will reach around 541,823 MW by 2031-32. IN 2014-15 Peak demand reported is 148166 MW. Similarly the energy requirement will reach 37, 10,083 MU by 2031-32. 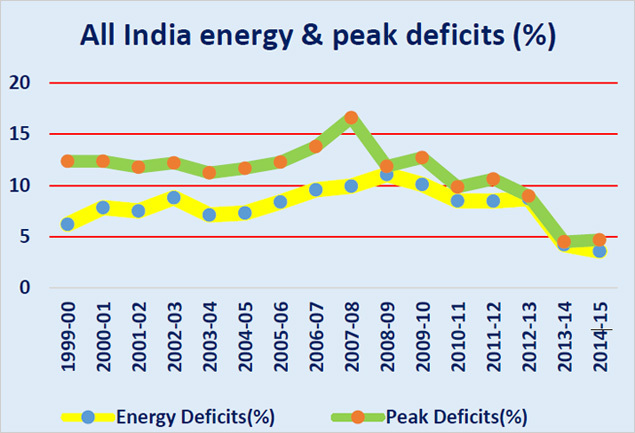 While there has been a reduction in energy and peak deficit since 2008-09, the reported deficits are still high. Actual deficits are higher than reported because of frequent load shedding across country. Generation mix continues to follow a flat trend for the past five years with coal being the dominant source. Renewable capacity has been increasing from 8% in 2008-09 to 12% in 2014-15, while the hydro share has shrunk from 25% to 17%. On Renewable energy front, GOI has set an ambitious target 175GW of capacity addition by 2022. Cross Border power trading in India has a long history. India is importing Hydro power from its neighbour Bhutan, of the order of 1.5 GW from Tala and Chukha HEP. 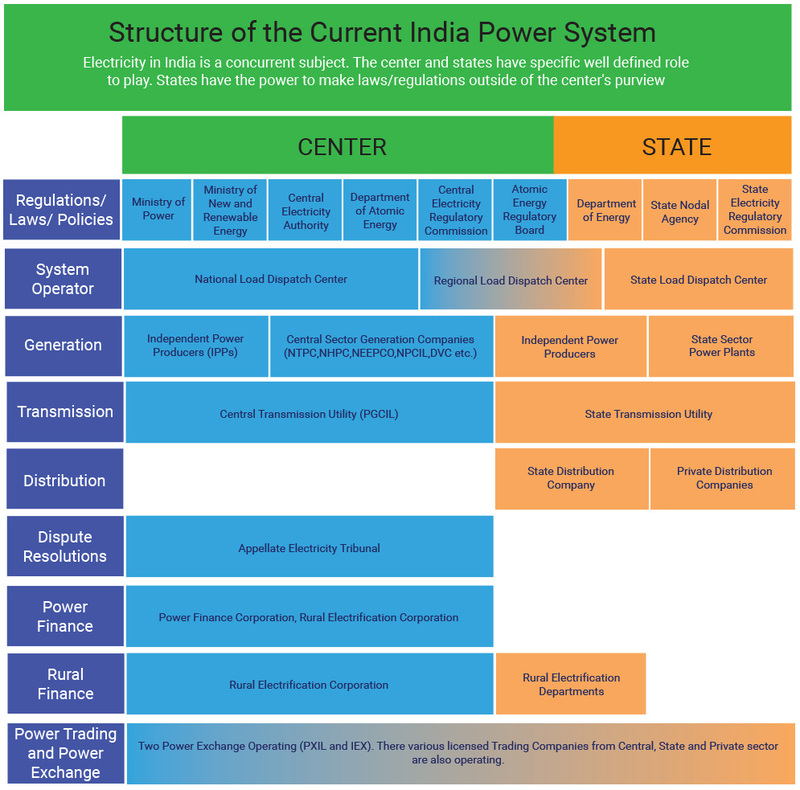 Power is basically injected into the grid in the Eastern part of India, and then transferred to Northern Region. During the 12th Five Year Plan, import has been pegged at about 3 GW under Bilateral agreements. Import of electricity is also envisaged during the 13th Plan under Pancheshwar under Mahakali agreement, between India and Nepal. Options of power imports from Myanmar, Bangladesh and Sri Lanka are also being explored. The detail of the country wise power trading and transmission interconnection is given below. Government of India is very keen on existing power trade and is working deeper power system, integration and cross border power trade in the region. India has been working to set up a multilateral SAARC Market for Electricity (SAME) and also plans to set up a SAARC power transmission grid. India plans to augment the existing line from Bhutan to import up to 5,000 MW power by 2020 through an HVDC transmission link. 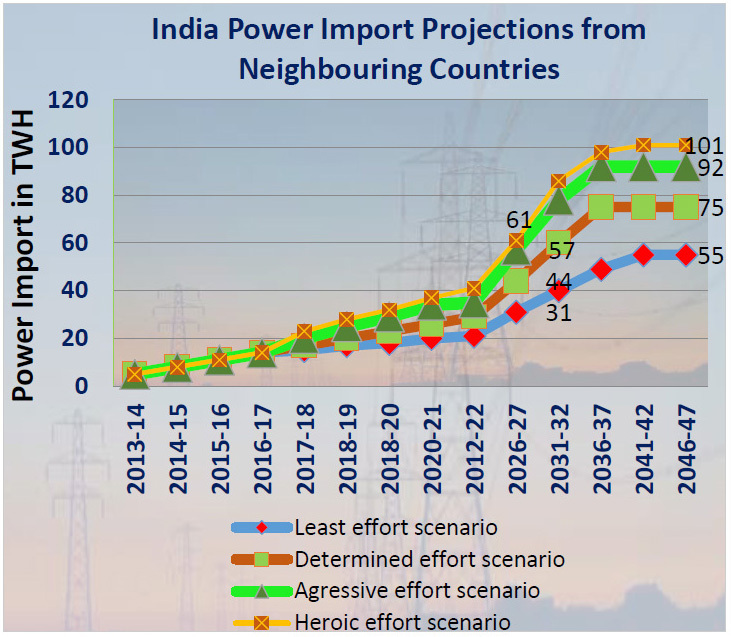 Long Term power import projections are given below. The total electricity import by 2046-47 will be in the range of 55 to 101 TWH across various scenarios. Cross Border Electricity Trade and Cross Border Interconnection with various South Asian Countries are Given Below. Electricity trade between India and Nepal had started in early 1970s but no significant trade has taken place between the two countries. Several river treaties viz. the Koshi, the Gandak and the Mahakali River treaty laid the foundation of electricity trade between India and Nepal. Power exchange between the two countries has been taking place through PTC India (the nodal agency).Power is being exchanged and traded mainly through 8 points through 33kV and 132kV links along the Indo-Nepal border. To facilitate power exchange, two committees exist: Power Exchange Committee constituted in 1992 and Joint Commission on Water Resources was commissioned in the year 2000. With the change of political regime in India steps have been taken for furtherance of trade. In a most recent initiative taken from both sides is the approval of India-Nepal Agreement on “Electric Power Trade, Cross-Border Transmission Interconnection and Grid Connectivity” commonly known as Power Trade Agreement (PTA). The PTA agreement will facilitate and further strengthen cross-border electricity transmission, grid connectivity and power trade between Nepal and India. Nepal is currently importing about 200 MW electricity from India annually through various 132 and 33 KV lines. New cross-border transmission lines Dhalkebar- Muzaffarpur400 KV line is under construction having a capacity of around 1200 MW. The agreement also provides a framework for imports, by Indian entities, of surplus power generated from future hydroelectric plants in Nepal, on mutually acceptable terms and conditions. There are many more lines are planned /proposed. For example Bardaghat- Gorakhpur 400 kV cross border HVDC line and Duhabi- Jogbani 400 KV AC line has been proposed. Besides, many export oriented mega projects like Upper Karnali (900 MW), Arun III (900 MW) and Mathillo Marsyandi (600 MW) etc. will have their own transmission system. Dhalkebar- Muzaffarpur 1200 400 Under cons. Arun-3 Project has been awarded by Government of Nepal to Sutlej Jal Vidyut Nigam Ltd. (SJVNL) on Build-Own-Operate-Transfer basis for a period of 30 years. Power development agreement (PDA) has been signed on 25.11.2014. Government of Nepal has awarded Upper Karnali hydropower project (300MW) to a consortium consisting of GMR Group companies and Italian-Thai Development Project Co of Thailand on build-own-operate-transfer basis. Power development agreement (PDA) on the same has been signed on 19.09.2014.Further, Consortium consisting of GMR Group companies and Italian-Thai Development Project Co of Thailand have also acquired development of Upper Marsyangdi (600 MW) in Nepal for which Power development agreement (PDA) is yet to be signed. Government of Nepal has also signed a Memorandum of Understanding (MoU) with Tata Power & SN Power, Norway on 6.3.2009 to develop Tamakoshi-3 (690 MW) for which Power development agreement (PDA) is yet to be signed. The History of hydro power corporation and power trade between India-Bhutan goes back in 1970. The Chhukha Hydropower project for which agreement for implementation of the Project was signed between the two governments of Bhutan and India on March 23, 1974. The project was fully funded by GoI with 60 percent grant and 40 percent loan at the interest rate of 5 percent payable over a period of 15 years after commissioning. Most of the generated energy is exported to India. The power trade India and Bhutan. Electricity trade between India and Bhutan is carried under the aegis of the umbrella agreement between the Government of India (GoI) and Royal Government of Bhutan (RGoB) aims to achieve development of 10, 000 MW by 2020. 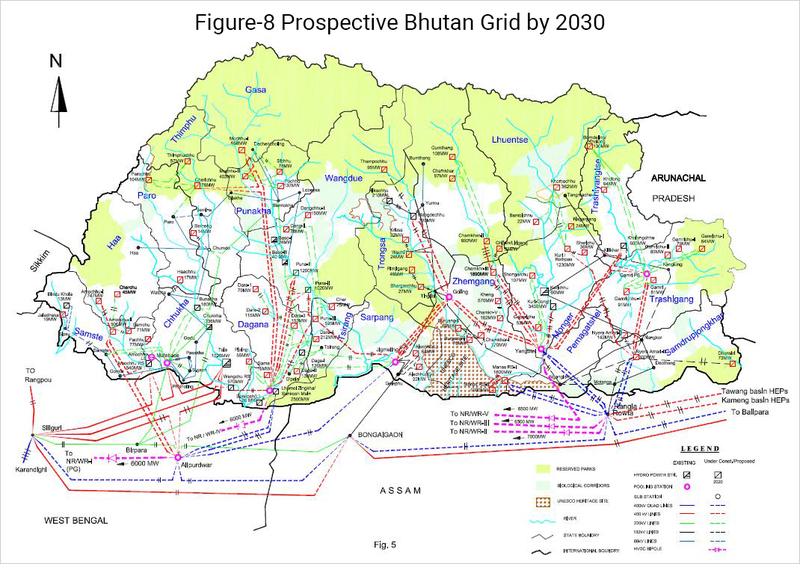 Bhutan’s total estimated hydropower potential is around 30 GW. The Royal Government of Bhutan has planned to harvest over 10,000 MW by 2020. For evacuation of power, National Grid Transmission Master Plan (NGTMP) has been prepared in cooperation with India (CEA) to meet the load growth and export surplus power to India. Several initiatives to fast track and achieve the set target have been undertaken by RGOB. Currently there are three existing cross border interconnections. Grid Reinforcement and evacuations of power from various hydro power projects has been planned as per the NTGMP of Bhutan. Government of India and Government of Bhutan are jointly developing various projects. (See the table below) under the umbrella agreement. In addition to above, The framework “Inter-Governmental Agreement between the Royal Government of Bhutan and the Government of the Republic of India concerning development of Joint Venture Hydropower Projects through the Public Sector Undertakings of the two Governments” was signed on 22 April 2014. The above Inter-Governmental agreement provides the framework for implementing four HEPs totalling 2120 MW (600 MW Kholongchu HEP, 180 MW Bunakha HEP (with 230 MW downstream benefit from Tala, Chukha and Wangchu HEPs), 570 MW Wangchu HEP, 770 MW Chamkarchu HEP). Bangladesh has a suitable geographical location for energy trade. It shares border with India and is in proximity to Bhutan and Nepal. There are various possible cross-border interconnecting transmission links identified between India and Bangladesh, Bhutan – Bangladesh and Nepal – Bangladesh. The western region of Bangladesh has an installed generation capacity of only 928 MW compared to 3962 MW in the Eastern region. The North-Eastern region in India can serve the western region deficit in Bangladesh. Bangladesh can even import power from hydro rich countries like Nepal and Bhutan from interconnection at Siliguri substation in India. The geographical location and energy resource distribution (Hydropower in Bhutan & Nepal, Coal in India and Gas in Bangladesh) are conducive for power trade among four countries. The interconnecting link between India – Bangladesh i.e. the Behrampur – Bheramara line commissioned in 2013. The MoU for this link was entered in 2010 by both the governments. Bangladesh Procures 250 MW through inter-governmental path and additional 250 MW from open market through trader (PTC), based on long term PPAs. The transmission systems of India and Bangladesh, are based on 400 kV alternate current (AC) and 230 kV AC respectively, and is synchronized by installing a back-to-back high voltage direct current (HVDC) link. The line currently has a transfer capacity of 500 MW. Recently decision has been taken for Capacity Up gradation (500MW) of Existing Bheramara HVDC Station Project to 1000 MW. In addition to above, (Eastern Interconnection Project) Tripura (India)– Comilla(Bangladesh) Grid Interconnection project (400 kV) project is also being initiated to import power from Palatana project in Tripura (India).Both India and Bangladesh have agreed in principle to evacuate power from the North-eastern region of India (Rangia/Rowta) to Muzaffarnagar of India through Bangladesh constructing a +/-800 KV, 7000 MW HVDC multi-terminal bi-pole DC grid line with suitable power tapping points at Barapukuria in Bangladesh. Additionally, Bangladesh presently is also in discussion with Nepal and Bhutan for CBET. 4 India-Bangladesh-India Evacuation of power from the North-eastern region of India (Rangia/Rowta) to Muzaffarnagar of India through Bangladesh. +/-800 KV,HVDC multi-terminal bi-pole DC line 7000 MW Proposed and agreed in principle. Currently there is no cross border interconnection between India and Sri Lanka. The proposal for Interconnection between India and Sri Lanka has been under consideration since mid-1970s. Pre-Feasibility studies have been undertaken with the assistance USAID in 2002 which is further being reviewed and executed by PGCIL and CEB. The proposed India-Sri Lanka 400kV HVDC grid interconnection involves the construction of a HVDC connection between Madurai in South India, and Anuradhapurain central Sri Lanka, through the Palk Strait. The transmission system between India and Sri Lanka will involve a submarine cable as the Indian Ocean separates India and Sri Lanka The link will have a proposed length of 285km, including50km of submarine cables. It may initially transfer up to 500MW of power and may eventually be able to transfer up to 1,000MW. A pre-feasibility study was conducted by PGCIL in 2006. This also led to establishing broad technical and economic aspects of the project. The link is expected to provide peak transfer from India to Sri Lanka and off-peak transfer in the reverse direction. The pre-feasibility study estimated a high level total quantum of transfer (that is, both import and export) could be of 1,836MWhpa. Electric interconnection between India and Sri Lanka could provide peaking support to Sri Lanka, where peak demand has already exceeded its hydro capacity. On the other hand, Sri Lanka may have surplus off-peak power that may be economically utilized to displace thermal generation in India. As on date, cross-border inter-connections for electricity trade between India (or any other South Asian Country) and Pakistan do not exist. However, discussions between India and Pakistan to establish power trade relations is in process. The World Bank has offered to finance a feasibility study for installation of transmission line to import 1,200 MW power from India. A draft MoU has been prepared by the Government of Pakistan and is under review at the Indian side. In March 2014, India had expressed its intent to export electricity to the tune of 500 MW to Pakistan immediately if infrastructure for transmission of power is made available. Pakistan would import 500MW of power initially, which would be enhanced to 1,000MW at a later stage, however, no firm details have been finalized/ materialized uptil now. India has already indicated that Pakistan could purchase power from Indian suppliers through their power exchanges under a competitive trading of electric power regime. However, bilateral agreement between the two governments also has its significance for such trade. The Ministry is concerned with perspective planning, policy formulation, processing of projects for investment decision, monitoring of the implementation of power projects, training and manpower development and the administration and enactment of legislation in regard to thermal, hydro power generation, transmission and distribution. The Ministry of Power is responsible for the Administration of the Electricity Act, 2003, the Energy Conservation Act, 2001 and to undertake such amendments to these Acts, as may be necessary from time to time, in conformity with the Government’s policy objectives. It is responsible for General Policy in the electric power sector and issues relating to energy policy and coordination thereof. (Details of short, medium and long-term policies in terms of formulation, acceptance, implementation and review of such policies, cutting across sectors, fuels, regions and intra country and inter country flows etc. Energy Equity: Per-capita energy consumption at par with the global average level by 2050, through a sustainable and diverse fuel- mix. Central Electricity Authority (CEA) is a statutory organization originally constituted under Section 3(1) of the repealed Electricity (Supply) Act, 1948, since substituted by Section 70 of the Electricity Act, 2003. It was established as a part-time body in 1951 and made a full-time body in 1975. 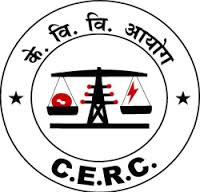 The functions and duties of CEA are delineated under Section 73 of the Electricity Act; 2003.Under the Electricity Act 2003, CEA prescribes the standards on matters such as construction of electrical plants, electric lines and connectivity to the grid, installation and operation of meters and safety and grid standards. The CEA is also responsible for concurrence of hydro power development schemes of central, state and private sectors taking into consideration the factors which will result in efficient development of the river and its tributaries for power generation, consistent with the requirement of drinking water, irrigation, navigation and flood control. The CEA advises central government, state governments and regulatory commissions on all technical matters relating to generation, transmission and distribution of electricity. It also advises state governments, licensees or generating companies on matters which enable them to operate and maintain the electricity system under their ownership or control in an improved manner. To regulate the tariff of generating companies owned or controlled by the Central Government. 5. Power System Operation Corporation Limited. Central Government through Ministry of Power in exercise of the power conferred by sub-section (3) of Sect 26 and sub-section (2) of Section 27 of the Electricity Act, 2003, by notification dated. 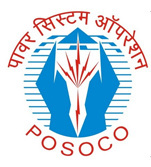 September 27, 2010 in the Gazette of India notified that the Power System Operation Corporation Ltd (POSOCO), a wholly owned subsidiary of the Power Grid Corporation of India Limited (a Government Company) shall operate National Load dispatch Centre and the five Regional Load dispatch Centers, with effect from October 1, 2010. The National Load dispatch Centre shall be Apex Body to ensure integrated operation of the national Power System and discharge the following functions. Scheduling and dispatch of electricity over inter-regional links in accordance with Grid standards specified by the Authority and Grid Code specified by the Central Commission in coordination with RLDCs. There are various central level companies which responsible various aspects of power generation. There are various independent power producers and private power developers who are very active in power generation. Some key central institutions such as National Thermal Power Corporation (NTPC), National Hydro Power Corporation (NHPC), North Eastern Electric Power Corporation Limited (NEEPCO), and Nuclear Power Corporation of India Limited (NPCIL) are briefly described below. NTPC is Central Public Sector Undertakings (CPSUs) is India’s largest energy conglomerate with roots planted way back in 1975 to accelerate power development in India. Since then it has established itself as the dominant power major with presence in the entire value chain of the power generation business. Present installed capacity of NTPC is 44,798 MW (including 6,196 MW through JVs) comprising of 40 NTPC Stations (17 Coal based stations, 7 combined cycle gas/liquid fuel based stations, 1 Hydro based station), 7 Joint Venture stations (6 coal based and one gas based) and 8 renewable energy projects.NTPC became a Maharatna company in May 2010, one of the only four companies to be awarded this status.NTPC’s mission is to develop and provide reliable power, related products and services at competitive prices, integrating multiple energy sources with innovative and eco-friendly technologies and contribute to society. NHPC Limited, a Govt. of India Enterprise, was incorporated in the year 1975 with an objective to plan, promote and organise an integrated and efficient development of hydroelectric power in all aspects. Later on NHPC expanded its objects to include development of power in all its aspects through conventional and non-conventional sources in India and abroad. At present, NHPC is a Mini Ratna Category-I Enterprise of the Govt. of India with an authorised share capital of Rs.1,50,000 Million. 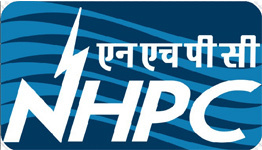 NHPC is ranked as a premier organization in the country for development of hydropower. Initially, on incorporation, NHPC took over the execution of Salal Stage-I, Bairasiul and Loktak Hydro-electric Projects from Central Hydroelectric Project Construction and Control Board. Since then, it has executed 20 projects with an installed capacity of 6507 MW on ownership basis including projects executed by NHDC Limited, a Subsidiary Company of NHPC Limited. NHPC has also executed 5 projects with an installed capacity of 89.35 MW on turnkey basis. Two of these projects have been commissioned in neighbouring countries i.e. Nepal and Bhutan. Presently NHPC is engaged in the construction of 5 projects aggregating to a total installed capacity of 4290 MW including 1000 MW (Pakal Dul HE Project) being executed through JV Company. 10 projects of 7151 MW are awaiting clearances/Govt. approval for their implementation including 3 Projects of 1186 MW to be executed through Subsidiary/Joint Venture Companies. 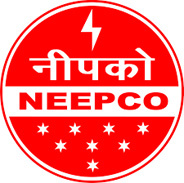 North Eastern Electric Power Corporation Limited (NEEPCO), a Miniratna Schedule “A” Government of India Enterprise under the Ministry of Power was set up on the 2nd of April, 1976 to plan, investigate, design, construct, generate, operate and maintain power stations in the North Eastern Region of the country. NEEPCO has an installed capacity of 1130 MW which is 47% of the total installed capacity of the N.E Region. The Nuclear Power Corporation of India Limited (NPCIL) is a government-owned corporation of India and is wholly owned by the Central Government and is responsible for the generation of nuclear power for electricity. NPCIL is administered by the Department of Atomic Energy, Govt. of India (DAE). The mission of the NPCIL is to The Mission of the Company is ‘to develop nuclear power technology and to produce nuclear power as a safe, environmentally benign and economically viable source of electrical energy to meet the increasing electricity needs of the country’. The Power Grid Corporation of India Limited (POWERGRID is an Indian state-owned electric utilities company headquartered in Gurgaon, India. POWERGRID transmits about 50% of the total power generated in India on its transmission network. Its subsidiary company, Power System Operation Corporation Limited (POSOCO) handles power management for Power Grid. POWERGRID also operates a telecom business under the name POWERTEL. PGCIL is also the Central Transmission Utility (CTU) of the country under Ministry of Power is one amongst the largest Power Transmission utilities in the world. Being Central Transmission utility it undertakes transmission of electricity through Interstate transmission systems (ISTS) and provides non-discriminatory open access to its transmission system for use by a license or generating company. PGCIL owns and operates about 1, 16,625 circuit kms of transmission lines at 800/765kV, 400kV, 220kV & 132kV EHVAC & +500kV HVDC levels and 195 sub-stations. Also the transformation capacity of about 2, 34,709 MVA as on 31st May 2015. This gigantic transmission network, spread over length and breadth of the country, is consistently maintained at an availability of over 99%. By virtue of Section 110 of The Electricity Act, 2003 (Central Act 36 of 2003) (hither after referred as the Act), an Appellate Tribunal for Electricity having jurisdiction throughout India has been set up to hear appeals or original petitions against the orders of the Adjudicating officer or The Central Regulatory Commission or State Regulatory Commission or Joint Commission constituted under Section 76(i) or 82 or 83 of the Act. The Tribunal is conferred with original jurisdiction to hear petitions under Section 121 of the Act and issue directions to any Appropriate Commission for the performance of its statutory functions. Main activities of APTEL are to entertain the appeals both under the Electricity Act, 2003 and under of the Petroleum and Natural Gas Regulatory Board Act, 2006 against the orders passed by the Central, Joint and State Electricity Regulatory Commissions as well as the Petroleum and Natural Gas Regulatory Board. Power Finance Corporation Ltd. is an Indian financial institution. 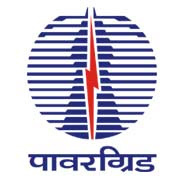 Established in 1986 and is the financial back bone of Indian Power Sector. PFC also the Nodal agency of various schemes being implemented by the Government. Rural Electrification Corporation Limited (REC) is a leading public Infrastructure Finance Company in India’s power sector. The company finances and promotes rural electrification projects across India. 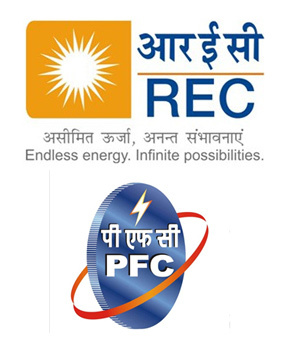 The company provides loans to Central/ State Sector Power Utilities, State Electricity Boards, Rural Electric Cooperatives, NGOs and Private Power Developers.REC is a Navratna Company functioning under the purview of the Ministry of Power–Government of India. The company is also nodal agency for implementing the various central schemes such as RGGVY, DDUVGY, and National Electricity Fund etc. Institution related to power exchange and power trading. In India currently two power exchanges are operating. Power Exchange is a licensed activity in India and licenses are granted by Central Electricity Regulatory Commission (CERC). INDIAN ENERGY EXCHANGE LTD. (IEX) is India’s premier power trading platform. Providing a transparent, neutral, demutualized and automated platform for physical delivery of electricity, IEX enables efficient price discovery and price risk management for participants of the electricity market, including industries eligible for open access. Today, about 4000 participants across utilities from 29 States, 5 Union Territories (UTs), 1000+ private generators (both commercial and renewable energy) and more than 3000 open access consumers are leveraging the Exchange platform to manage their power portfolio in the most competitive and reliable way. The various product segments are1) Day-Ahead Market (DAM) 2) Term-Ahead Market (TAM) 3) Renewable Energy Certificates (REC) 4) Energy Saving Certificates (ESCerts). Ina addition to exchange, power is also traded through power traders. There are many power traders exist in Indian power market. Trading is a license activity in India and trading licensed are issued by Central Electricity Regulatory Commission (CERC). Since electricity is concurrent subject in India, in most of the states, there are adequate institutional arrangements for overall governance of the power sector. In most states there exist Department of Energy which looks after overall policy associated with electricity and in some states also covers energy sector. Each state has their own State Electricity Regulatory Commissions. This commission has been established as per the Electricity Regulatory Commission Act, 1998, a Central Act which was superceded by Electricity Act (EA), 2003. Most of the states have their own load dispatch centre for dispatch of power. Historically these SLDCs were evolved as part of the State transmission utilities. In some states they have more than one load dispatch centres as well as area load dispatch centres. These SLDCs works in close coordination with regional load dispatch centres for any dispatch of power outside of the state. Historically sates used to have Sate Electricity Boards (SEBs) which are vertically integrated monopolies and used to take care of Generation, Transmission and distributions. After the reform initiative took place, most of the State governments have undergone a process of power sector reform and SEBs has been unbundled to different Generation, Transmission and Distribution companies. Most of the state currently have their own Generation companies owned by the states. In some sates the Generation are privatized. In addition to above there are independent power procedures at the state level who also looks after power generation. All the state governments have their own Transmission utilities. Transmission utilities have been separated as distinct in most of the sates after reform initiative was undertaken. State Transmission Utilities (STUs) are responsible for Power Transmission in the states. Distribution in India has remained with states. DISCOMs are responsible for power distribution within the designated geographically area. Majority of the DISCOMSs continues to be State Govement owned. The reform penetration in distribution has been very less and level privatization has been limited to few states. Nepal is a landlocked country on the southern slope of the Himalayas, located between China in the north and India in east, south and west- two huge countries with vibrant economies. Politically, it has been designated as a Federal Democratic Republic since May 2008. Majority of population lives in the rural areas and level of urbanization has remained around 17%. Table 1 mentions some basic facts of Nepal. 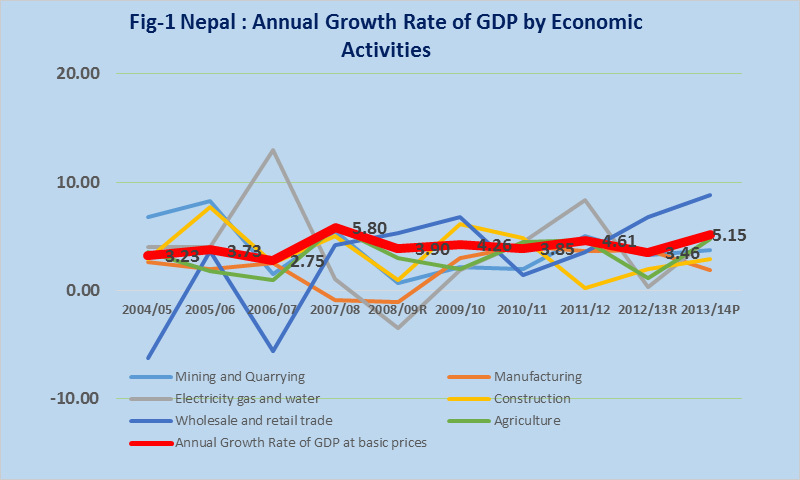 Nepal economy primarily depends on Agriculture. Agriculture employs 70% of the population and provides 37% of GDP. Only about 20% of the total area is cultivable; another 33% is forested; most of the rest is mountainous. Nepal is among the poorest and least developed countries in the world, with about one-quarter of its population living below the poverty line. Industrial activity mainly involves the processing of agricultural products, including pulses, jute, sugarcane, tobacco, and grain. The annual GDP growth rate by economic actives are given in the fig-1. Real GDP at basic prices is estimated to grow by 5.15 percent in fiscal year 2013/14 against the target of 5.5 percent. Such growth rate in the previous fiscal year was 3.5 percent. Economic growth rate reached over 5.0 percent in fiscal year 2013/14 after last five years. This is due to favourable monsoon, gradual improvement in investment environment, the environment of political consensus and cooperation, among others. Nepal has rich water resources and possess very good hydro power potential. 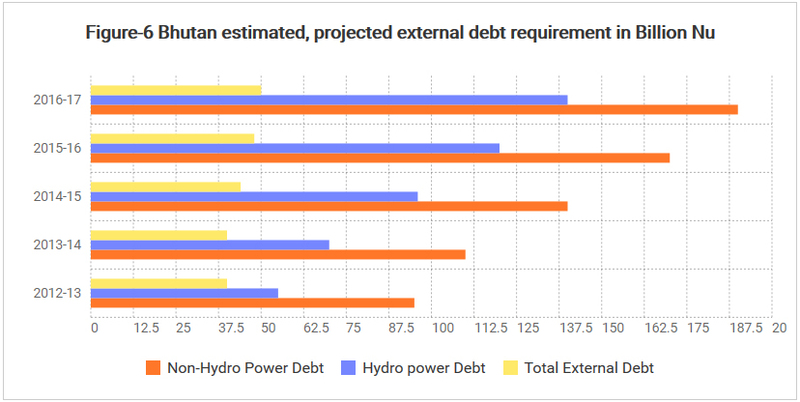 It is estimated that around 83 GW hydro potential across various river basins is available in Nepal out of which 42GW is the economically feasible hydro power potential. Current power installed capacity is around 792 MW out of which 734 MW( 93%) is generated from Hydro Resources and 53 MW (7%) is generated from thermal resources. Most of the installed hydro capacity (about 87 percent) in Nepal is Run-of-River (ROR) type and electricity generation from these plants is highly dependent on river flow, therefore during winter seasons, the electricity production from the plants reduces which further impacts the availability of the electricity. Nepal’s per capita primary electricity consumption (103 KWH per Capita) is one of the lowest in the world. Only 63% of the population has aces to grid electricity but due to high load shedding of (around 12 hours per day) actual use of electricity by the population has remained constrained. Nepal’s persistent energy shortage and frequent power outages which severely constrained economic growth. Nepal has experience a peak electricity deficits of 44 % in the year 2011-2012. Due to this Households rely on costly and harmful alternative fuel sources, for example, kerosene oil for lighting is not only a poor source of illumination, but it is also environmentally harmful and damaging to the health of its users. Nepal’s annual peak energy demand and annual energy demand is growing at 9 % and 8.5 percent respectively. 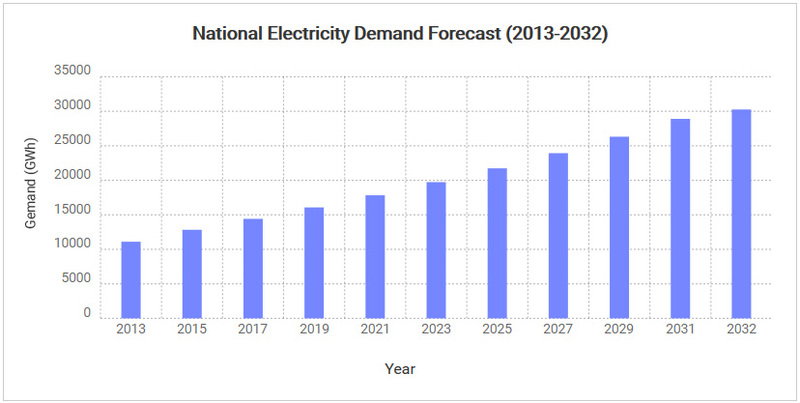 It is estimate that Nepal’s will have peak load demand of 5622 MW in the year 2032. To meet this future demand Nepal has come with various plans for meeting the demand through development of hydro power potentials. The government of Nepal Plans to develop 10,000 MW of hydro power in 10 years and 25,000 MW in 20 years. Electricity trade between India and Nepal had started in early 1970s but no significant trade has taken place between the two countries. Several river treaties viz. the Koshi, the Gandak and the Mahakali River treaty lay the foundation of electricity trade between India and Nepal. Power exchange between the two countries has been taking place through PTC India (the nodal agency).Power is being exchanged and traded mainly through 8 points through 33kV and 132kV links. along the Indo-Nepal border. To facilitate power exchange, two committees exist: Power Exchange Committee constituted in 1992 and Joint Commission on Water Resources was commissioned in the year 2000. The PTA agreement will facilitate and further strengthen cross-border electricity transmission, grid connectivity and power trade between Nepal and India. Nepal is currently importing about 200 MW electricity from India annually through various 132 and 33 KV lines. New cross-border transmission lines Dhalkebar- Muzaffarpur 400 KV line is under construction having a capacity of around 1200 MW. The agreement also provides a framework for imports, by Indian entities, of surplus power generated from future hydroelectric plants in Nepal, on mutually acceptable terms and conditions. There are many more lines are planned /proposed. For example Bardaghat- Gorakhpur 400 kV cross border HVDC line and Duhabi- Jogbani 400 KV AC line has been proposed. . Besides, many export oriented mega projects like Upper Karnali (900 MW), Arun III (900 MW) and Mathillo Marsyandi (600 MW) etc will have their own transmission system. Government of Nepal plans for developing 10,000 Mw in next 10 years and 25,000 mw in 25 years. For development of 10,000 Mw hydro power around US$ 7.21 billion will be required. Investment required for transmission projects under Construction, planned and proposed is estimated to be around USD 1.786 Billion. There are many projects being pursed currently which are Cross Border Power in nature. Project Development Agreement (PDA) has been concluded for development of 1) 900 MW Upper Karnali project to be developed by GMR India and 2) 900 MW Arun -3 to be developed SJVNL, India. PDA for 1) 600 MW Upper Marsyangdi (to be developed by GMR 2) 750 MW West Seti – CWE (to be developed by Three Gorges) and 3) 880 MW Tamakosi III (to be developed by SN Power ). Some key projects and its investment requirement in given below. Ministry of Energy is responsible for development of policies, plan and implementation for conservation, regulation and utilization of energy. It’s mission is for sustainable generation of various form of electric power i.e. Hydro, wind, bio mass etc. and supply of reliable electricity to all parts of the country through efficient transmission and distribution lines. WECS provides assistance to the concerned ministries in formulation policies and objectives to be included in the perspective/periodic plan relating to the water resources and energy sector. It formulate policies and strategies for the water resources and energy sector and render opinion, advice and recommendation on the bilateral and multilateral issue relating to water resources and energy. Nepal Electricity Authority (NEA) was created on August 16, 1985 (Bhadra 1, 2042) under the Nepal Electricity Authority Act. 1984, through the merger of the Department of Electricity of Ministry of Water Resources, Nepal Electricity Corporation and related Development Boards. NEA is vertically integrated Monopoly is the sole body responsible for Generation, transmission, distribution and trading of electricity in Nepal. The primary objective of NEA is to generate, transmit and distribute adequate, reliable and affordable power by planning, constructing, operating and maintaining all generation, transmission and distribution facilities in Nepal’s power system both interconnected and isolated. The Department is responsible for assisting the Ministry of Energy in implementation of overall government policies related to power/electricity sector. The major functions of the Department are to ensure transparency of regulatory framework, accommodate, promote and facilitate private sector’s participation in power sector by providing “One Window” service and license to power projects. As per the Electricity Tariff Fixation Rules, 2050 (1994), Electricity Tariff Fixation Commission to fixe electricity tariff and other charges and reviews the tariff rates and other charges to be charged to the consumers against the services rendered to them through the generation, transmission or distribution of the electricity by the licensee. 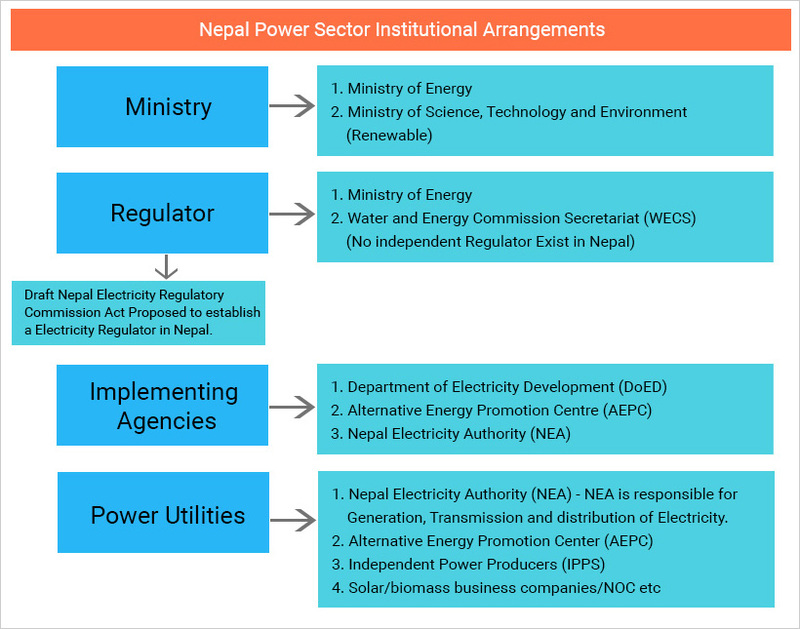 Currently Nepal do not have an independent regulator, and for establishing independent electricity regulator, the proposed regulatory commission act is pending before the parliament. Under the Ministry of Science, Technology and Environment, Alternative Energy Promotion Centre is working on to make renewable energy mainstream resource through increased access, knowledge and adaptability contributing for the improved living conditions of people in Nepal. Sri Lanka, an island in the Indian Ocean is located to the south of the Indian subcontinent. It lies between 5° 55′ and 9° 55′ north of the equator and between the eastern longitudes 79° 42′ and 81° 52′. The total land area is 65,610 sq. km. and is astonishingly varied. A length of 445 km. and breadth of 225 km. encompasses beautiful tropical beaches, verdant vegetation, ancient monuments and a thousand delights to please all tastes. The relief features of the island consist of a mountainous mass somewhat south of the centre, with height exceeding 2,500 metres, surrounded by broad plains. Palm fringed beaches surround the island and the sea temperature rarely falls below 27°C. Government: Sri Lanka is a democratic, socialist republic and a unitary state which is governed by a semi-presidential system, with a mixture of a presidential system and a parliamentary system. Sri Lanka is one of the fastest growing economies in South Asia. During the period 2006–2010, the GDP growth in the country has been around eight percent. In 2014, Sri Lanka achieved a growth rate of 8.3 percent with a strong performance by the industry and services sectors. Sri Lanka’s electricity requirement is growing at an average rate of six to eight percent annually and this trend is expected to continue. 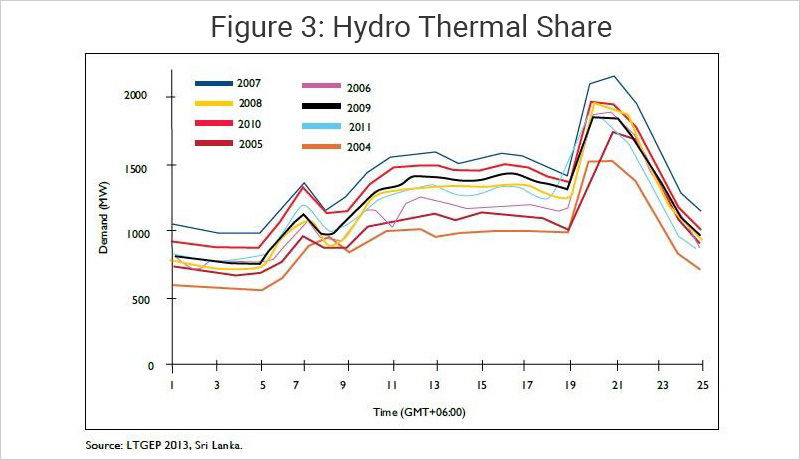 In 2012, the total installed capacity of Sri Lanka was 3,334 MW and the peak demand was 2,146 MW. It is estimated that the total peak demand will be 6,461 MW by 2032. 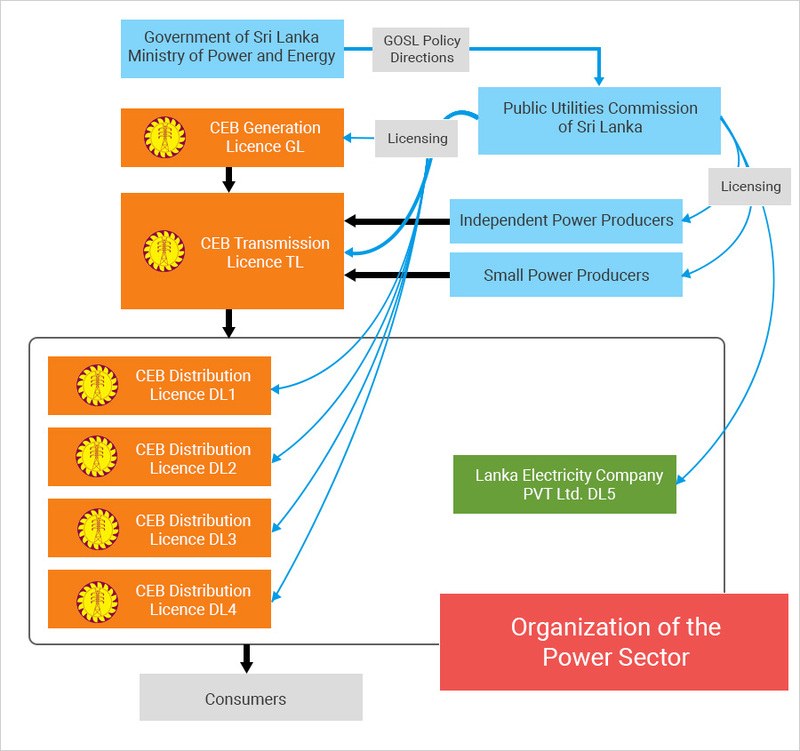 Energy supply in Sri Lanka is mainly based on the following primary indigenous resources: Hydro, Wind, Biomass and Solar. But has no proven oil, gas or coal resources. 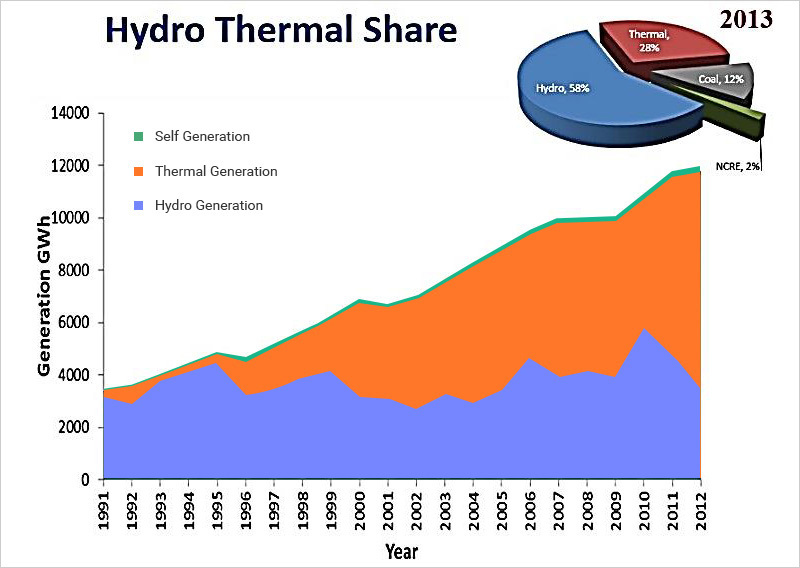 Most of the hydro resources have been tapped and over the years the share of thermal resources in the total energy mix is increasing. Though the country does not have any coal resources, it has planned to develop a 4,000 MW coal-based thermal plant by 2032. Sri Lanka and India are in advance stages of discussion on a HVDC submarine link for CBET. The estimated cost of this interconnection for 500 MW is approximately US$ 554 million. This interconnection will provide Sri Lanka the opportunity to enter the Indian power market for power trading and have access to electricity from relatively cheaper sources of generation. Moreover, Sri Lanka has a significant evening peak, as high as 2,163 MW, whereas the off-peak demand is as low as 600 MW (Figure 4). Therefore, during the off-peak hours most of the power plants are backed down, which otherwise could be traded in SA countries if there was a physical interconnection between India and Sri Lanka. 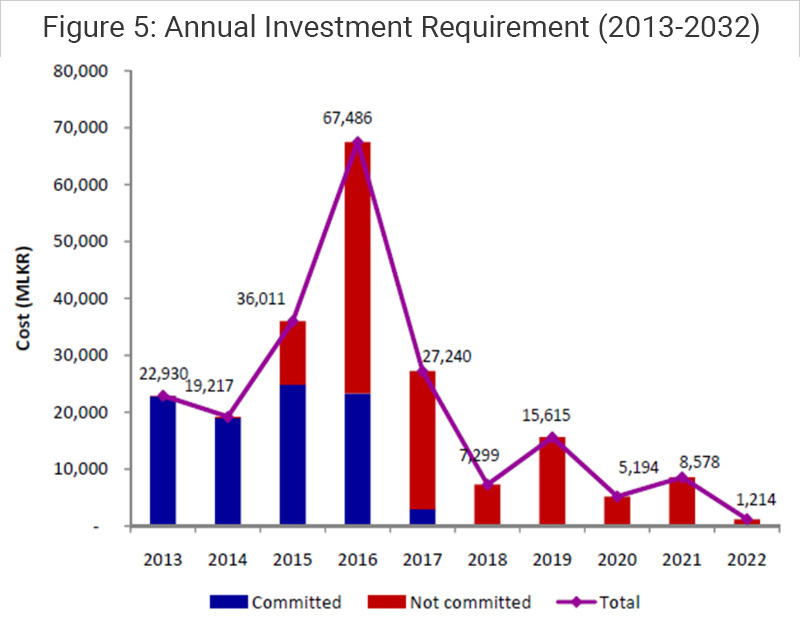 As per the long-term generation and transmission expansion plans, a total investment of approximately US$ 14.05 billion is required by 2032.This expansion gives ample opportunities to investors, developers, power equipment manufacturers, cable manufacturers (particularly for the planned HVDC submarine cable between India and Sri Lanka), and so on in developing power projects and associated transmission infrastructure. Implementation of policies, plans and programs with respect to Power and Energy. Investigation, Planning, implementation and co-ordination of energy matters. Investigation, planning and development of electricity facilities throughout the island including hydro power, thermal power, mini-hydro and coal power etc. Development of a sound, adequate and uniform electricity policy for the control, regulation and utilization of national power resources. Energy efficiency, demand management etc. The transmission system between India and Sri Lanka will involve a submarine cable as the Indian Ocean separates India and Sri Lanka. This interconnection would be different from any other electricity interconnections planned in the South Asia Region. Asynchronous type i.e. HVDC interconnection is considered to be the best option for the interconnection of two grids. Facilitate development of renewable energy resources, thereby conserving non-renewable primary energy resources and improving the environment.